This recipe was inspired by some of the “Blackberry Crush” wines on the Homebrew Talk forums. It uses the Blackberry Crush juice from Trader Joe’s. Blackberry Crush is a blend of apple, grape, and blackberry juice; As well as blackberry puree. It looks like this. Thanks Google! Use this juice + honey to make a mead. When I refer to cyser style below, I mean that I replaced all the water with juice. similar to how you use all apple juice in cyser or all pear juice in a perry. 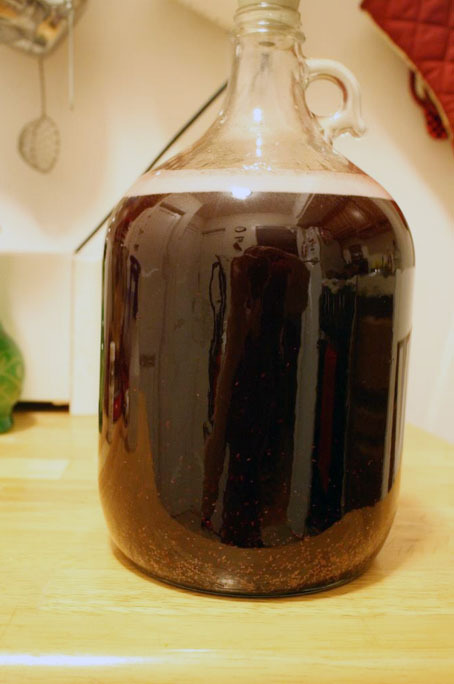 Mead using a blackberry juice blend. To begin, sanitize all your equipment. After sanitizing I poured half of 1 64oz jug of the Blackberry Crush juice. Then I poured the honey into the free space in that jug. Next I shook it into oblivion, and added the remainder of that jug with the honey in it. Finally, I just added more juice until the volume was 1 gallon. The must was already well aerated from all the shaking to incorporate the honey. SNA: I added 50% of the total nutrients at pitch and will add 25% at first sign of fermentation and the other 25% the next day after fermentation. The color is a beautiful, very deep purple. 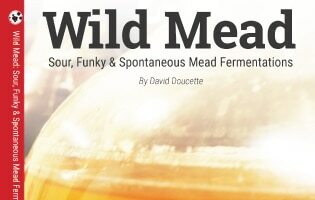 Should be a really cool looking mead when all is said and done. Still in lag phase. It will either kick in by the time I’m home from work, or over the next night. Fermentation kicked off when I got home from work. Very small amount of foam. I added 1/4 tsp of nutrient (up to 75% total SNA). I’ll add the remaining 1/4 tsp when the gravity reaches around 1.063 (the 1/3 sugar break). I went to check the gravity on this so I could add the remaining dosage of nutrients. The gravity was 1.013. In other words, way past the 1/3 break, and actually nearing the end of fermentation. I put this in the closet to finish up on its own. I’ll check the gravity again next weekend and stabilize it if it’s finished. I’ll backsweeten it a tad and add the lemon once the yeast have been killed off. Just a taste test today. Was really good as far as young meads go. Especially dry ones. Still a lot of blackberry notes which is good because it means that the flavors weren’t all blown off in primary fermentation. Just enough tartness from the blackberries. Not overpowering at all. I changed my recipe plan from adding a few segments of lemon to oaking it instead. Added bentonite today. Once that has done its thing, I’ll rack this off primary into secondary, on top of stabilizers and oak. That oak should really meld well with the tart blackberry notes in this mead. Taste Update: Good tart notes survived fermentation. I still need to rack off the lees. No autolysis to report to this moment but there is a good 3/4 of an inch of sediment on the bottom. Not very clear in bulk, but looks similar to a blueberry mead in the glass. It’s further along than I had thought. Racked off all the lees finally. There were a ton, so hopefully most of them have dropped out. Not sure this mead will ever be clear in “bulk” (similar to my bochet). 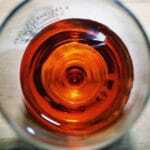 In a glass, and traveling through the siphon lines, the color is a clear but deep purple. Didn’t taste test this time since I knew it was doing fine last month and figured I’d save the rest for a finished product. Gravity Check 1.001 ABV 12.25%. I tasted the hydrometer sample and it’s coming along very nicely. the acid from the blackberries brings on a subtle sweetness that is clearly reminiscent of blackberries. There are a few notes of fussel alcohols, but I have no doubt that some age will knock them down no problem. In bulk it is very dark. 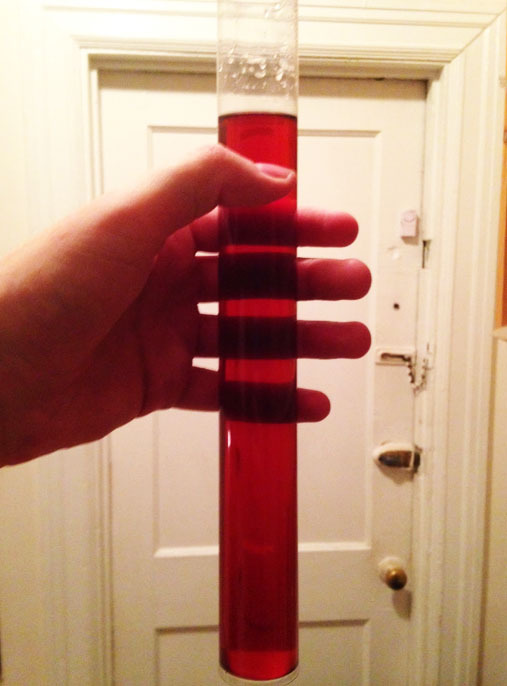 A flashlight won’t shine all the way through but you can detect some clarity, but the mead is definitely 90% or more cleared (as you can see from the hydrometer sample picture, my hand is clearly seen through it.) I added oak to this mead for the final stretch of bulk aging before I age this out in bottles.